The Kent State shootings—also known as the May 4 massacre or the Kent State massacre — occurred at Kent State University in the U.S. city of Kent, Ohio, and involved the shooting of unarmed college students by the Ohio National Guard on Monday, May 4, 1970. The guardsmen fired 67 rounds over a period of 13 seconds, killing four students and wounding nine others, one of whom suffered permanent paralysis. There was a significant national response to the shootings: hundreds of universities, colleges, and high schools closed throughout the United States due to a student strike of four million students, and the event further affected the public opinion—at an already socially contentious time—over the role of the United States in the Vietnam War. Richard Nixon had been elected President in 1968, promising to end the Vietnam War. In March 1968, the My Lai Massacre by American troops of an estimated 504 women and children in a Vietnamese village was exposed, leading to increased public opposition in the United States to the war. In addition, the following month saw the first draft lottery instituted since World War II. The war had appeared to be winding down throughout 1969, so the new invasion of Cambodia angered those who believed it only exacerbated the conflict. Many young people, including college students and teachers, were concerned about being drafted to fight in a war that they strongly opposed. The expansion of that war into another country appeared to them to have increased that risk. Across the country, campuses erupted in protests in what Time called "a nation-wide student strike", setting the stage for the events of early May 1970. President Nixon announced to the nation that the "Cambodian Incursion" had been launched by United States combat forces. At Kent State University a demonstration with about 500 students was held on May 1 on the Commons (a grassy knoll in the center of campus traditionally used as a gathering place for rallies or protests). As the crowd dispersed to attend classes by 1 pm, another rally was planned for May 4 to continue the protest of Nixon's expansion of the Vietnam War into Cambodia. There was widespread anger, and many protesters issued a call to "bring the war home." As a symbolic protest to Nixon's decision to send troops, a group of students watched a graduate student burning a copy of the U.S. Constitution while another student burned his draft card. Trouble exploded in town around midnight when people left a bar and began throwing beer bottles at cars and breaking downtown store fronts. In the process they broke a bank window, setting off an alarm. The news spread quickly and it resulted in several bars closing early to avoid trouble. Before long, more people had joined the vandalism and looting. By the time police arrived, a crowd of 120 had already gathered. Some people from the crowd had already lit a small bonfire in the street. The crowd appeared to be a mix of bikers, students, and transient people. A few members of the crowd began to throw beer bottles at the police, and then started yelling obscenities at them. The entire Kent police force was called to duty as well as officers from the county and surrounding communities. Kent Mayor LeRoy Satrom declared a state of emergency, called Ohio Governor Jim Rhodes' office to seek assistance, and ordered all of the bars closed. The decision to close the bars early increased the size of the angry crowd. Police eventually succeeded in using tear gas to disperse the crowd from downtown, forcing them to move several blocks back to the campus. City officials and downtown businesses received threats while rumors proliferated that radical revolutionaries were in Kent to destroy the city and university. Mayor Satrom met with Kent city officials and a representative of the Ohio Army National Guard. Following the meeting Satrom made the decision to call Governor Rhodes and request that the National Guard be sent to Kent, a request that was granted. Because of the rumors and threats, Satrom believed that local officials would not be able to handle future disturbances. The decision to call in the National Guard was made at 5:00 pm, but the guard did not arrive into town that evening until around 10 pm A large demonstration was already under way on the campus, and the campus Reserve Officer Training Corps (ROTC) building was burning. The arsonists were never apprehended and no one was injured in the fire. More than a thousand protesters surrounded the building and cheered its burning. Several Kent firemen and police officers were struck by rocks and other objects while attempting to extinguish the blaze. Several fire engine companies had to be called in because protesters carried the fire hose into the Commons and slashed it. The National Guard made numerous arrests and used tear gas; at least one student was slightly wounded with a bayonet. During a press conference at the Kent firehouse, an emotional Governor Rhodes pounded on the desk and called the student protesters un-American, referring to them as revolutionaries set on destroying higher education in Ohio. "We've seen here at the city of Kent especially, probably the most vicious form of campus oriented violence yet perpetrated by dissident groups. They make definite plans of burning, destroying, and throwing rocks at police, and at the National Guard and the Highway Patrol. This is when we're going to use every part of the law enforcement agency of Ohio to drive them out of Kent. We are going to eradicate the problem. We're not going to treat the symptoms. And these people just move from one campus to the other and terrorize the community. They're worse than the brown shirts and the communist element and also the night riders and the vigilantes", Rhodes said. "They're the worst type of people that we harbor in America. Now I want to say this. They are not going to take over the campus. I think that we're up against the strongest, well-trained, militant, revolutionary group that has ever assembled in America." Rhodes can be heard in the recording of his speech yelling and pounding his fists on the desk. Around 8:00 pm, another rally was held on the campus Commons. By 8:45 pm the Guardsmen used tear gas to disperse the crowd, and the students reassembled at the intersection of Lincoln and Main Streets, holding a sit-in with the hopes of gaining a meeting with Mayor Satrom and President White. At 11:00 p.m., the Guard announced that a curfew had gone into effect and began forcing the students back to their dorms. A few students were bayoneted by Guardsmen. On Monday, May 4, a protest was scheduled to be held at noon, as had been planned three days earlier. University officials attempted to ban the gathering, handing out 12,000 leaflets stating that the event was canceled. Despite these efforts an estimated 2,000 people gathered on the university's Commons, near Taylor Hall. The protest began with the ringing of the campus's iron Victory Bell (which had historically been used to signal victories in football games) to mark the beginning of the rally, and the first protester began to speak. Companies A and C, 1/145th Infantry and Troop G of the 2/107th Armored Cavalry, Ohio Army National Guard (ARNG), the units on the campus grounds, attempted to disperse the students. The legality of the dispersal was later debated at a subsequent wrongful death and injury trial. On appeal, the United States Court of Appeals for the Sixth Circuit ruled that authorities did indeed have the right to disperse the crowd. The dispersal process began late in the morning with campus patrolman Harold Rice, riding in a National Guard Jeep, approaching the students to read them an order to disperse or face arrest. The protesters responded by throwing rocks, striking one campus Patrolman and forcing the Jeep to retreat. Just before noon, the Guard returned and again ordered the crowd to disperse. When most of the crowd refused, the Guard used tear gas. Because of wind, the tear gas had little effect in dispersing the crowd, and some launched a second volley of rocks toward the Guard's line, too distant to have any effect, to chants of "Pigs off campus!" The students lobbed the tear gas canisters back at the National Guardsmen, who wore gas masks. When it was determined the crowd was not going to disperse, a group of 77 National Guard troops from A Company and Troop G, with bayonets fixed on their M-1 rifles, began to advance upon the hundreds of protesters. As the guardsmen advanced, the protesters retreated up and over Blanket Hill, heading out of The Commons area. Once over the hill, the students, in a loose group, moved northeast along the front of Taylor Hall, with some continuing toward a parking lot in front of Prentice Hall (slightly northeast of and perpendicular to Taylor Hall). The guardsmen pursued the protesters over the hill, but rather than veering left as the protesters had, they continued straight, heading down toward an athletic practice field enclosed by a chain link fence. Here they remained for about ten minutes, unsure of how to get out of the area short of retracing their path (an action some guardsmen considered might be viewed as a retreat). During this time, the bulk of the students congregated off to the left and front of the guardsmen, approximately 150 ft (50m) to 225 ft (75m) away, on the veranda of Taylor Hall. Others were scattered between Taylor Hall and the Prentice Hall parking lot, while still others (perhaps 35 or 40) were standing in the parking lot, or dispersing through the lot as they had been previously ordered. While on the practice field, the guardsmen generally faced the parking lot which was about 100 yards away. At one point, some of the guardsmen knelt and aimed their weapons toward the parking lot, then stood up again. For a few moments, several guardsmen formed a loose huddle and appeared to be talking to one another. The guardsmen seemed to be unsure about what to do next. They had cleared the protesters from the Commons area, and many students had left, but some stayed and were still angrily confronting the soldiers, some throwing rocks and tear gas canisters. About ten minutes later, the guardsmen began to retrace their steps back up the hill toward the Commons area. Some of the students on the Taylor Hall veranda began to move slowly toward the soldiers as the latter passed over the top of the hill and headed back down into the Commons. At 12:24 pm, according to eyewitnesses, a Sgt. Myron Pryor turned and began firing at the students with his .45 pistol. A number of guardsmen nearest the students also turned and fired their M1 Garand rifles at the students. In all, 29 of the 77 guardsmen claimed to have fired their weapons, using a final total of 67 rounds of ammunition. The shooting was determined to have lasted only 13 seconds, although John Kifner reported in the New York Times that "it appeared to go on, as a solid volley, for perhaps a full minute or a little longer." The question of why the shots were fired remains widely debated. The Adjutant General of the Ohio National Guard told reporters that a sniper had fired on the guardsmen, which itself remains a debated allegation. Many guardsmen later testified that they were in fear for their lives, which was questioned partly because of the distance between them and the students killed or wounded. Time magazine later concluded that "triggers were not pulled accidentally at Kent State." The President's Commission on Campus Unrest avoided probing the question of why the shootings happened. Instead, it harshly criticized both the protesters and the Guardsmen, but it concluded that "the indiscriminate firing of rifles into a crowd of students and the deaths that followed were unnecessary, unwarranted, and inexcusable." The shootings killed four students and wounded nine. 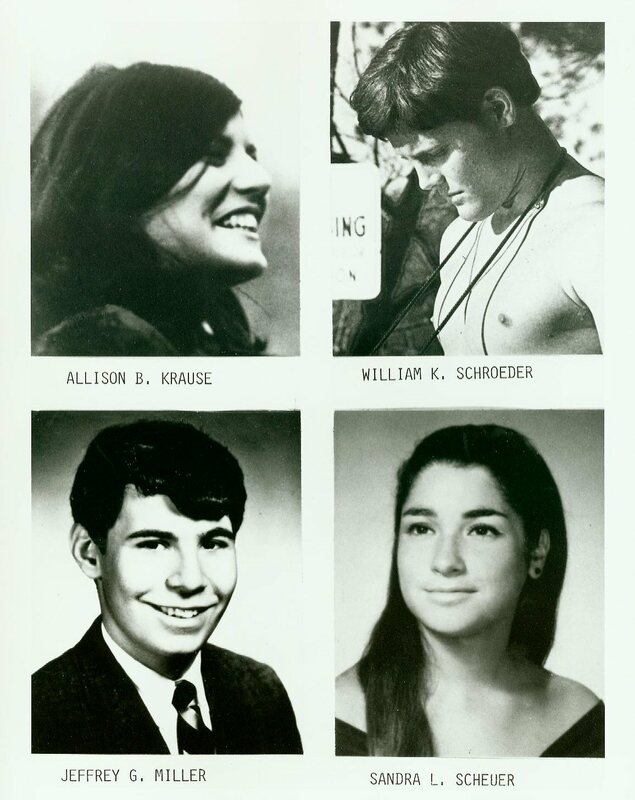 Two of the four students killed, Allison Krause and Jeffrey Miller, had participated in the protest, and the other two, Sandra Scheuer and William Knox Schroeder, had been walking from one class to the next at the time of their deaths. Schroeder was also a member of the campus ROTC battalion. Of those wounded, none was closer than 71 feet to the guardsmen. Of those killed, the nearest (Miller) was 265 feet away, and their average distance from the guardsmen was 345 feet. Two men who were present related what they saw. Unidentified speaker 1: "Suddenly, they turned around, got on their knees, as if they were ordered to, they did it all together, aimed. And personally, I was standing there saying, they're not going to shoot, they can't do that. If they are going to shoot, it's going to be blank." Unidentified speaker 2: "The shots were definitely coming my way, because when a bullet passes your head, it makes a crack. I hit the ground behind the curve, looking over. I saw a student hit. He stumbled and fell, to where he was running towards the car. Another student tried to pull him behind the car, bullets were coming through the windows of the car.